After experiencing several changes to the card’s featured attraction, “UFC 137: Penn vs. Diaz” has undergone yet another facelift just eight days before showtime. On Friday, the organization announced Brad Tavares had suffered an undisclosed injury that will force him out of his middleweight scrap against Dustin Jacoby. The 185-pounders were just promoted to the main card on Tuesday after welterweight champ Georges St-Pierre withdrew with from his main event contest with Carlos Condit after hurting his knee and hamstring. Jacoby will now face fellow Octagon rookie Clifford Starks in a preliminary contest. 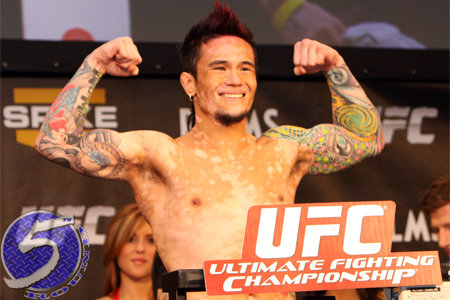 After petitioning for a slot on the pay-per-view broadcast after GSP bowed out, Scott Jorgensen (Pictured) was finally granted his wish today. His bantamweight brawl against Jeff Curran has been bumped to the big show. The Mandalay Bay Events Center in Las Vegas, Nevada will host the October 29th extravaganza. A welterweight shootout between BJ Penn and Nick Diaz will headline the festivities.